It has been a while since I posted news on Holy Cross so I figured today is the day to catch you all up today on that. One of the most exciting things going on there isÂ a new state of the art bathroom facility -Â 26 toilets and 2 large trough urinals. Thanks goes out to the Episcopal Church Women for their generous grant which provided the money to get this project underway and a huge thank you to the many volunteers who have worked and continue to work in the hot Belizean sun to make this incredibly needed facility a reality. Holy Cross will have the most environmental friendly bathrooms in the country and hope that this will set a new trend. They are thrilled to be ecologically sound and to get rid of the huge lines at potty break. The good news does not stop there – I was chatting on the coconut phone with Heather from Direct Abundance yesterday and she said that a rep from waste water gardens who is connected with Planetary Coral Reef Foundation plans to to visit San Mateo and do an assessment – now that would be a great light at the end of the tunnel for an area that needs so much help to get set up with eco friendly plumbing. This next piece is from an email I received this morning from someone who is working towards helping Holy Cross get a permanent space on Global Giving website. I am writing to you to ask you to support Holy Cross Anglican School (HCAS) in the Global Giving Green Open challenge. To give you a little background, HCAS is a school in San Mateo, Ambergis Caye, off the coast of Belize. 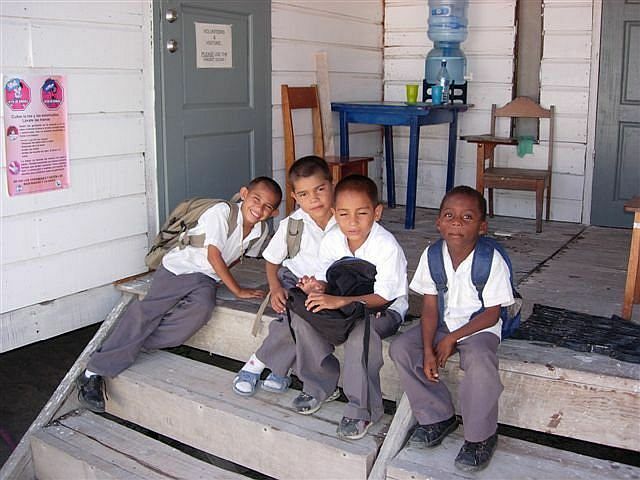 In Belize, even public education is not free. HCAS, which is funded through donation, provides pre-kindergarten through eighth grade education to 500 students. These 500 kids are the most disadvantaged on the island and would not have the opportunity of education without HCAS. Not only do these kids receive schooling at HCAS, but they also receive two meals per day; sometimes the only food they eat. HCAS was selected as one of 20 organizations to participate in the Global Giving Green Open challenge. San Mateo is currently powered by diesel generators, making it extremely difficult and costly to consistently operate the volunteer built dental clinic and computer lab. Through GlobalGiving.org, we have the opportunity to install a combination of wind generators and solar panels. This will provide reliable, effective energy and help bolster Holy Cross Anglican School. HCAS is the only school on the Island with a computer lab this robust and large and opens its doors to adult education programming to serve the greater community. Both the dental clinic and computer lab are huge resources to San Mateo. Through the Green Open challenge, HCAS has a HUGE opportunity to become a PERMANENT link on the GlobalGiving.org website. All we need is 50 different donors and a total of $4,000 in donations. For only $10 dollars, you can provide enough electricity for one computer for one month. For $75, you can provide enough electricity to support the dental clinic for one month. We only have until July 30th to complete the challenge, so please act quickly if this is something you feel you can support. HCAS is a school that I fully support and believe will impact and improve the lives of thousands of children and the greater economy of Belize. By providing renewable energy to HCAS, we can help sustain this incredible place. I sincerely thank you for your thoughts and any (tax-deductible) contributions you can make to HCAS. Thanks Holly – hope all goes well for your student here. I’ve got a student working in San Ignacio for the fall months and will be going to Belize to do a site visit and check out other social work placement opportunities… so I’ve been looking to blogs written by folks living in Belize. Just de-lurking to give you props for writing about these worthy causes!! Thanks! Liked the heart warming aspects of tis blog on rainy gloomy day.